To Cite: Li J, Li Q, Lu J, Li Z. Immunosuppressive Therapy in Children With Steroid-Resistant Nephrotic Syndrome, Iran J Pediatr. 2018 ; 28(1):e11567. doi: 10.5812/ijp.11567. Background: Treatment of steroid-resistant nephrotic syndrome (SRNS) remains a huge challenge in pediatric patients. Immunosuppressive agents including cyclosporine A (CsA), tacrolimus (TAC) and mycophenolate mofetil (MMF) are recommended for the management of children with SRNS. The aim of this study was to compare the efficacy of CsA, TAC and MMF in children with SRNS and provide guidance for clinical practice. Methods: This is a retrospective analysis of the records of 70 children with SRNS recruited from a children hospital over a period of seven years. They were treated with CsA, TAC and MMF as initial immunosuppressive therapy in addition to steroids. Complete or partial remission was considered a good response. Results: Five (41.7%) of 12 children who were on CsA therapy achieved remission at 6 months and 5 (41.7%) at 12 months. Nine (19.1%) of 47 patients treated with TAC achieved remission at 6 months, 20 (42.6%) at 12 months and 6 (12.8%) within or over 24 months. The remission achieved at 6 months and 12 months was 4 (36.4%) and 2 (18.2%) respectively in MMF group. The relapse rates in children who had achieved remission were 30.0%, 45.7% and 50.0% in CsA, TAC and MMF group respectively. Conclusions: Based on similar baseline characteristics, CsA and TAC as initial therapy for SRNS have a better remission and relapse rates whereas MMF shows a rapid remission effect. Nephrotic syndrome has become a common chronic illness in childhood and the most common form is idiopathic nephrotic syndrome (INS) (1, 2). INS is defined as the combination of a nephrotic syndrome (massive proteinuria, hypoalbuminemia, hyperlipidemia and edema) and nonspecific histological abnormalities of the glomeruli including minimal changes, focal and segmental glomerular sclerosis, and diffuse mesangial proliferation (3). 10 - 20% of patients with INS have steroid-resistant nephrotic syndrome (SRNS) (4, 5), defined as persistent proteinuria after a 4 to 8 weeks course of oral prednisolone (6), which is associated with a 50% risk for end-stage renal disease (ESRD) within 5 years after diagnosis if patients do not achieve a partial or complete remission (7). Treatment of SRNS remains a difficult challenge in pediatric nephrology, with patients showing a variable response to immunosuppression, adverse effects of prolonged therapy and risk of progressive renal damage (8). Calcineurin inhibitors including cyclosporine A (CsA) and tacrolimus (TAC) have been recommended by Kidney Disease Improving Global Outcomes (KDIGO) and the Chinese Association of Pediatric Nephrology as initial therapy for children with SRNS (9, 10). For less adverse drug effects, mycophenolate mofetil (MMF) in combination with steroids and angiotensin-converting enzyme-inhibitor drugs also shows some efficacy in the management of SRNS and has been used in clinical practice (11, 12). The aim of this study was to compare the efficacy of CsA, TAC and MMF in children with SRNS. We retrospectively analyzed the medical records of children with SRNS hospitalized in Children’s hospital of Fudan University between March 2009 and May 2015. The study was approved by the ethics committee of our hospital. Our study included children with SRNS who received immunosuppressive agents as initial therapy. The range of age at onset was from 6 months to 15 years, and they were all routinely followed up in our nephrology department. Patients with incomplete records, congenital kidney disease or secondary nephrotic syndrome, severe infection, chronic liver and kidney dysfunction were excluded. Data collected from the patients included age at onset, gender, medical history, laboratory data (serum creatinine, serum total protein and cystatin C), clinical symptoms, renal biopsy, medical treatment, concomitant steroids, treatment duration and hospitalization costs. Follow-up data of efficiency including remission, relapse, dialysis and adverse drug reactions were also recorded. SRNS was defined as failure to achieve remission after prednisone or prednisolone had been orally administered for a minimum of 8 weeks (9). Complete remission was defined as disappearance of proteinuria and normalization of serum albumin levels. Partial remission was defined as absence of edema, serum albumin > 25 g/L and a proteinuria of 100 - 1000 mg/m2/day. No response was defined as persisting nephrotic range proteinuria and serum albumin levels < 25 g/L (13). Children enrolled in this study were treated initially with prednisolone at a dose of 2 mg/kg/day in the morning for 8 weeks and the maximum dose was no more than 80 mg/day. SRNS was diagnosed if they did not achieve complete remission during this period. In addition to steroids, children included in our study were treated with the following immunosuppressive agents: CsA, TAC and MMF. Oral steroids were also prescribed in daily dose of 0.5 - 1 mg/kg/day for 1 - 2 months and thereafter, every other day in gradually tapering dosage daily. CsA was given orally with a dose of 4 - 6 mg/kg/day in two divided doses and whole blood trough level was monitored after 1 - 2 weeks, which should be maintained to 100-200 μg /L by adjusting the CsA dose. TAC was administered orally every 12 hours with a dose of 0.1 - 0.15 mg/kg/day, keeping the trough level on 5 - 10 μg/L. A dose of 20 - 30 mg/kg/day MMF was divided into two equal doses and it was adjusted to maintain a whole blood trough level of 2.5 - 4.0 mg/L. Another regimen of CsA, TAC, MMF and rituximab or combination therapy was started if a therapeutic regimen failed to induce remission. Results were analyzed using IBM SPSS Advanced Statistics, version 22.0 (IBM© Corp., Armonk, NY, USA). Variables were compared using paired or unpaired t-test and χ2 test. Variables with normal distributions were expressed as mean ± SD and categorical variables were expressed as percentages. Statistical significance was determined as P < 0.05. The baseline characteristics of the population at the time of initial presentation are summarized in Table 1. We analyzed 70 children from three groups, among which 12 patients received CsA, 47 patients received TAC and 11 patients received MMF. Except for gender (P = 0.035) and concomitant steroids (P = 0.021), no significant differences were found in other characteristics, such as age at onset (P = 0.352), histopathology (P = 0.515), serum creatinine (P = 0.799), serum total protein (P = 0.969) and cystatin C (P = 0.618). The most frequent histopathological diagnoses for all cases were minimal change nephrotic syndrome (MCNS) and focal segmental glomerular sclerosis (FSGS) in 48 cases (68.6%) and 16 cases (22.8%) respectively. Medication of different pathological types are shown in Table 1. In CsA group, the most frequent pathological diagnosis was MCNS in 8 (66.7%), followed by FSGS in 3 (25.0%). Similarly, among TAC and MMF group, it was MCNS in 34 (72.4%) and 6 (54.4%) followed by FSGS in 8 (17.0%) and 5 (45.5%) cases separately. All immunosuppressive therapies were combined with steroids, of which, 17 (24.3%) concomitant steroids were methylprednisolone and 53 (75.7%) were prednisolone. As for CsA group, in 11 (91.7%) children it was combined with prednisolone while in the other one (8.3%) with methylprednisolone. In TAC group, 31 (66.0%) cases received prednisolone and 16 (34.0%) methylprednisolone. However, all patients in MMF group were treated with concomitant prednisolone. Outcomes of different immunosuppressive therapy regimens are presented in Table 2. At 6 months, a total of 18 (25.7%) patients achieved remission. After that 27 (38.6%) children got remission within 1 year and 6 (8.6%) within or over 2 years. Five (41.7%) of 12 children who were on CsA therapy achieved remission at 6 months and 5 (41.7%) at 12 months. Nine (19.1%) of 47 patients treated with TAC achieved remission at 6 months, 20 (42.6%) at one year and 6 (12.8%) within or over 2 years. For MMF group, the remission achieved at 6 months and 12 months were 4 (36.4%) and 2 (18.2%). The cumulative percentage of remission in 51 children with remission is shown in Figure 1. Through the Kaplan-Meier analysis, we found that the median time for achieving remission was 6 months, 8 months and 3 months in CsA, TAC and MMF group (P = 0.004) respectively. Two children in our series, who were treated with TAC initially, progressed to end-stage renal disease (ESRD) and received dialysis. The relapse rate of children who achieved remission was 43.1%, which was 30.0%, 45.7% and 50.0% in CsA, TAC and MMF group separately. For the relapsed cases, a secondary treatment was chosen, which included CsA, TAC, MMF and rituximab. We switched the therapy with CsA in 2 of 3 relapsed children to TAC and 1 to rituximab. In TAC group, three of 16 relapsed cases started CsA, seven received MMF and others were treated with rituximab. For 3 patients who relapsed after MMF therapy, one was switched to TAC and two to CsA. Only one serious adverse drug reaction (ADR) was observed in all patients, which was an acute kidney injury (AKI) in TAC group. In this patient, TAC was discontinued and rituximab administered. No significant difference was found in hospitalization days (P = 0.361) and hospitalization costs (P = 0.897) between the three groups. aData are presented as No (%) or mean ± SD. SRNS treatment is challenging and a rich area of research has been published. In this work we demonstrated the practice of SRNS treatment in our hospital and compared the outcomes of different treatment options. We found no significant difference in baseline of age at onset, histopathology, serum creatinine, serum total protein and cystatin C of all children in addition to gender and concomitant steroids difference. Children enrolled in this study all received an initial immunosuppressive therapy when the diagnosis was established, which was the basis of our comparison study. In all three groups, there were more boys than girls, which was in accordance with others studies (14-17). The most frequent histopathologic subtypes in our study were MCNS in 68.6% and FSGS in 22.8%, followed by mesangial proliferative glomerular nephritis (MesPGN) in 8.6%. Similar biopsy results of 66% MCNS and 24% FSGS in SRNS children were reported by Straatmann et al (14), while in other studies, FSGS was the most frequent finding (2, 12, 14, 18). This difference may be due to the small study population and various medication habits in different clinic settings. Despite different biopsy results, FSGS and MCNS still are the main pathological types in SRNS children. In all pathological types, mostly TAC was administered. TAC as a calcineurin inhibitor (CNI) is recommended by KDIGO as one of the initial therapy for children with SRNS (19). Choudhry et al suggested tacrolimus as a promising alternative to CsA in view of the lower risk of relapses and lack of cosmetic side effects (20). We had 34 TAC treatments in 48 MCNS children and 8 in 16 FSGS patients, while the numbers were 8 and 3 for CsA, which indicates a preference for TAC in our hospital. Corresponding to this clinical use, AKI was the only serious ADR found in TAC treatment. As for the outcomes, of 51 children who received CsA and MMF all achieved remission within 1 year, the total remission rate of CsA, TAC and MMF was 83.4%, 61.7% and 54.6% respecyively. CsA treated children achieved a 41.7% remission rate at 6 months, this was 36.4% and 19.1% in MMF and TAC group. This was much lower than reported in previous studies (12, 13, 20-22), they all reported a 6 months’ remission rate of over 50%. Whether the significant difference and doses of concomitant steroids led to this result deserves further study. At 12 months, the remission rate of CsA, TAC and MMF was 41.7%, 42.6% and 18.2%. Six cases (12.8%) who received TAC therapy achieved remission within or over 24 months. Results from the Kaplan-Meier analysis demonstrated that MMF therapy took a shorter time to reach remission and TAC therapy needed the longest, the statistical difference was significant (P = 0.004). The relapse rates of three therapy regimens were 30.0%, 45.7% and 50.0% for CsA, TAC and MMF respecyuvely. Based on similar baseline characteristics of the study population, MMF showed a rapid efficacy on pediatric SRNS. MMF is reported to induce the reduction of proteinuria with partial remission (23). However, some studies have reported positive results with decrease in relapse rate, less proteinuria, and steroid sparing dose without any nephrotoxic effect (24, 25). Due to lack of side effects such as liver and kidney toxicity and myelosuppression, MMF has become a commonly used immunosuppressant, but the study results are variable with regard to its efficacy in SRNS children (16). In our study, the total remission rate of MMF was lowest and the relapse rate was highest, while CsA showed a highest remission rate and a lowest relapse rate. Because of the small number of cases in CsA and MMF group compared to TAC, a larger study population is needed to conclude more reasonable results. Secondary treatment was conducted in all relapsed cases after treatment with CsA, TAC, MMF and rituximab. Of all 22 patients showing relapse, in 7 (31.8%) therapy was switched to rituximab and in an equal number to MMF, in 5 (22.7%) to CsA and in 3 (13.7%) to TAC. The efficacy of rituximab in SRNS children has not been confirmed (4). Rituximab is safe and well tolerated in most patients. However, it has been associated with several serious adverse events, such as fatal hepatitis induced by rituximab reactivation of hepatitis B virus (26), progressive multifocal leukoencephalopathy (27), immune-mediated ulcerative colitis (28) and hypersensitivity reactions (29). Prospective cohort studies are needed to determine the long-term consequences of rituximab therapy in children with SRNS. During the follow up period, two patients finally progressed to ESRD. FSGS as the initial histopathological pattern was found to be a predictive factor of progression to ESRD, particularly in those who could not attain remission (30). In our study, the histopathological diagnosis of one child was FSGS and another was MCNS. Despite renal pathology, genetic factors and ethnicity seem to modulate the response to treatment and progression of ESRD (31, 32). Another study also found that increased episodes of AKI were associated with increased risk of ESRD, but the causality was not established (18). As a chronic disease, SRNS could impose a huge economic burden on patients and their families. However, we found no statistically significant difference in hospitalization days and costs of hospitalization. Evidence on pharmacoeconomic evaluation of treatments for SRNS need to be identified to provide guidance for clinical practice (33). As limiting factors that could have impact on proper assessment in this study is to mention that it was a single-center study with a small sample size, and was not a randomized controlled trial, which may lead to bias. Therefore, multi-center studies with large sample sizes are needed to verify these results in the future. Findings from this study suggest that CsA and TAC as initial therapy for children with SRNS have a better remission as well as the relapse rate than MMF, whereas MMF shows a rapid remission. 1. Eddy AA, Symons JM. Nephrotic syndrome in childhood. Lancet. 2003;362(9384):629-39. 2. Hodson EM, Wong SC, Willis NS, Craig JC. Interventions for idiopathic steroid-resistant nephrotic syndrome in children. Cochrane Database Syst Rev. 2016;10. CD003594. doi: 10.1002/14651858.CD003594.pub5. [PubMed: 27726125]. 3. Niaudet P, Boyer O. Idiopathic Nephrotic Syndrome in Children: Clinical Aspects. Springer Berlin Heidelberg; 2016. p. 667-702. 4. Iijima K, Sako M, Nozu K. Rituximab for nephrotic syndrome in children. Clin Exp Nephrol. 2017;21(2):193-202. doi: 10.1007/s10157-016-1313-5. [PubMed: 27422620]. 5. Al Salloum AA, Muthanna A, Bassrawi R, Al Shehab AA, Al Ibrahim A, Islam MZ, et al. Long-term outcome of the difficult nephrotic syndrome in children. Saudi J Kidney Dis Transpl. 2012;23(5):965-72. doi: 10.4103/1319-2442.100877. [PubMed: 22982908]. 6. Internacional Study of Kidney Disease in Children . Nephrotic Syndrome in children: prediction of histopathology from clinical and laboratory characteristics at time of diagnosis. Kidney Int. 1978;13(2):159-65. 7. Gipson DS, Chin H, Presler T. Differential risk of remission and ESRD in childhood FSGS. Pediatr Nephrol. 2006;21(3):344-9. doi: 10.1007/s00467-005-2097-0. [PubMed: 16395603]. 8. Sinha A, Bagga A. Nephrotic syndrome. Indian J Pediatr. 2012;79(8):1045-55. doi: 10.1007/s12098-012-0776-y. [PubMed: 22644544]. 9. Lombel RM, Hodson EM, Gipson DS, Kidney Disease: Improving Global O. Treatment of steroid-resistant nephrotic syndrome in children: new guidelines from KDIGO. Pediatr Nephrol. 2013;28(3):409-14. doi: 10.1007/s00467-012-2304-8. [PubMed: 23052648]. 10. Wu B, Mao J, Shen H, Fu H, Wang J, Liu A, et al. 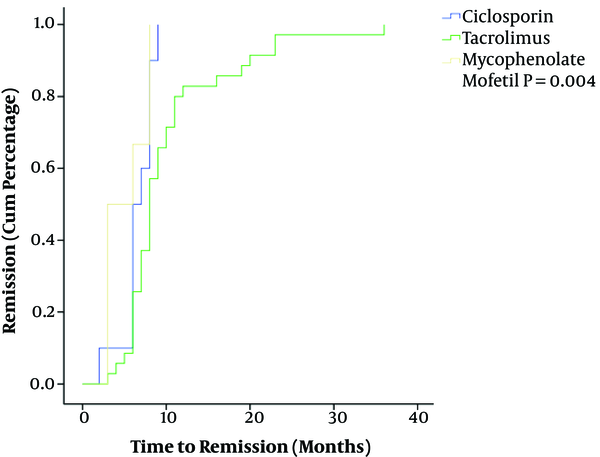 Triple immunosuppressive therapy in steroid-resistant nephrotic syndrome children with tacrolimus resistance or tacrolimus sensitivity but frequently relapsing. Nephrology (Carlton). 2015;20(1):18-24. doi: 10.1111/nep.12351. [PubMed: 25312783]. 11. Moudgil A, Bagga A, Jordan SC. Mycophenolate mofetil therapy in frequently relapsing steroid-dependent and steroid-resistant nephrotic syndrome of childhood: current status and future directions. Pediatr Nephrol. 2005;20(10):1376-81. 12. Li ZH, Lin Z, Duan CR, Wu TH, Xun M, Zhang Y, et al. [Comparison of therapeutic effects of prednisone combined with mycophenolate mofetil versus cyclosporin A in children with steroid-resistant nephrotic syndrome]. Zhongguo Dang Dai Er Ke Za Zhi. 2016;18(2):130-5. [PubMed: 26903059]. 13. Klaassen I, Ozgoren B, Sadowski CE, Moller K, van Husen M, Lehnhardt A, et al. Response to cyclosporine in steroid-resistant nephrotic syndrome: discontinuation is possible. Pediatr Nephrol. 2015;30(9):1477-83. doi: 10.1007/s00467-015-3109-3. [PubMed: 25903641]. 14. Straatmann C, Ayoob R, Gbadegesin R, Gibson K, Rheault MN, Srivastava T, et al. Treatment outcome of late steroid-resistant nephrotic syndrome: a study by the Midwest Pediatric Nephrology Consortium. Pediatr Nephrol. 2013;28(8):1235-41. doi: 10.1007/s00467-013-2483-y. [PubMed: 23633037]. 15. Basu B, Mahapatra TK, Mondal N. Mycophenolate Mofetil Following Rituximab in Children With Steroid-Resistant Nephrotic Syndrome. Pediatrics. 2015;136(1):e132-9. doi: 10.1542/peds.2015-0486. [PubMed: 26101364]. 16. Li Z, Duan C, He J, Wu T, Xun M, Zhang Y, et al. Mycophenolate mofetil therapy for children with steroid-resistant nephrotic syndrome. Pediatr Nephrol. 2010;25(5):883-8. doi: 10.1007/s00467-009-1375-7. [PubMed: 19953275]. 17. Mekahli D, Liutkus A, Ranchin B, Yu A, Bessenay L, Girardin E, et al. Long-term outcome of idiopathic steroid-resistant nephrotic syndrome: a multicenter study. Pediatr Nephrol. 2009;24(8):1525-32. doi: 10.1007/s00467-009-1138-5. [PubMed: 19280229]. 18. Beins NT, Dell KM. Long-Term Outcomes in Children with Steroid-Resistant Nephrotic Syndrome Treated with Calcineurin Inhibitors. Front Pediatr. 2015;3:104. doi: 10.3389/fped.2015.00104. [PubMed: 26640779]. 19. Sotelomundo RR. Chapter 4: Steroid-resistant nephrotic syndrome in children. Kidney Int Suppl (2011). 2012;2(2):172-6. doi: 10.1038/kisup.2012.17. [PubMed: 25018929]. 20. Choudhry S, Bagga A, Hari P, Sharma S, Kalaivani M, Dinda A. Efficacy and safety of tacrolimus versus cyclosporine in children with steroid-resistant nephrotic syndrome: a randomized controlled trial. Am J Kidney Dis. 2009;53(5):760-9. doi: 10.1053/j.ajkd.2008.11.033. [PubMed: 19268410]. 21. Peña A, Bravo J, Melgosa M, Fernandez C, Meseguer C, Espinosa L, et al. Steroid-resistant nephrotic syndrome: long-term evolution after sequential therapy. Pediatr Nephrol. 2007;22(11):1875-80. 22. Hamasaki Y, Yoshikawa N, Hattori S, Sasaki S, Iijima K, Nakanishi K, et al. Cyclosporine and steroid therapy in children with steroid-resistant nephrotic syndrome. Pediatr Nephrol. 2009;24(11):2177-85. doi: 10.1007/s00467-009-1264-0. [PubMed: 19714370]. 23. Cattran DC, Wang MM, Appel G, Matalon A, Briggs W. Mycophenolate mofetil in the treatment of focal segmental glomerulosclerosis. Clin Nephrol. 2004;62(6):405-11. 24. Diamond PH, Gruzinov AV. Immunosupressive therapy in children with steroid-resistant nephrotic syndrome: single center experience. J Bras Nefrol. 2013;35(3):200-5. doi: 10.5935/0101-2800.20130032. [PubMed: 24100739]. 25. Ulinski T, Dubourg L, Saïd MH, Parchoux B, Ranchin B, Cochat P. Switch from cyclosporine A to mycophenolate mofetil in nephrotic children. Pediatr Nephrol. 2005;20(4):482-5. 26. Tsutsumi Y, Kanamori H, Mori A. Reactivation of hepatitis B virus with rituximab. Expert Opin Drug Saf. 2005;4(3):599-608. doi: 10.1517/14740338.4.3.599. [PubMed: 15934864]. 27. Boren EJ, Cheema GS, Naguwa SM. The emergence of progressive multifocal leukoencephalopathy (PML) in rheumatic diseases. J Autoimmun. 2008;30(1-2):90-8. doi: 10.1016/j.jaut.2007.11.013. [PubMed: 18191544]. 28. Ardelean DS, Gonska T, Wires S, Cutz E, Griffiths A, Harvey E, et al. Severe ulcerative colitis after rituximab therapy. Pediatrics. 2010;126(1):e243-6. doi: 10.1542/peds.2009-3395. [PubMed: 20566611]. 29. Ahn YH, Kang HG, Lee JM, Choi HJ, Ha IS, Cheong HI. Development of antirituximab antibodies in children with nephrotic syndrome. Pediatr Nephrol. 2014;29(8):1461-4. doi: 10.1007/s00467-014-2794-7. [PubMed: 24619426]. 30. Inaba A, Hamasaki Y, Ishikura K, Hamada R, Sakai T, Hataya H, et al. Long-term outcome of idiopathic steroid-resistant nephrotic syndrome in children. Pediatr Nephrol. 2016;31(3):425-34. doi: 10.1007/s00467-015-3174-7. [PubMed: 26335197]. 31. Hjorten R, Anwar Z, Reidy KJ. Long-term Outcomes of Childhood Onset Nephrotic Syndrome. Front Pediatr. 2016;4:53. doi: 10.3389/fped.2016.00053. [PubMed: 27252935]. 32. Hibino S, Uemura O, Nagai T, Yamakawa S, Iwata N, Ito H, et al. Three year outcome of childhood idiopathic nephrotic syndrome under a unified immunosuppressive protocol. Pediatr Int. 2015;57(1):85-91. doi: 10.1111/ped.12498. [PubMed: 25225083]. 33. Colquitt J, Kirby J, Green C. The clinical effectiveness and cost-effectiveness of treatments for children with idiopathic steroid-resistant nephrotic syndrome: a systematic review. Health Technol Assess. 2007;11(21):1-93.